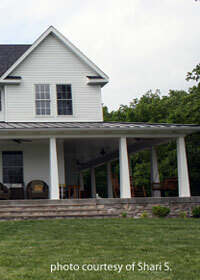 Not all country style porches are large wrap-arounds, although that is a distinguishing feature. 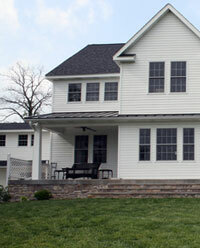 Country porches are typically spacious with lots of room for relaxing and visiting with friends and neighbors. 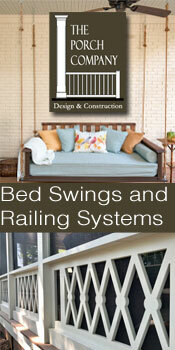 No matter whether you have a wrap around or other style porch, our ideas will help you create your perfect porch. 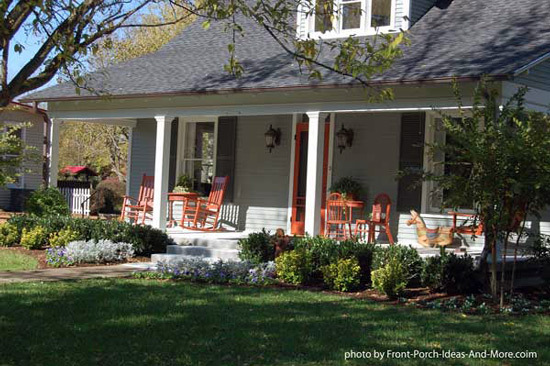 Take note of the simplicity of these porches and how they provide a welcoming place for all. Whether its kids playing games or folks relaxing with a glass of wine and cheese, they are a wonderful place to make memories. 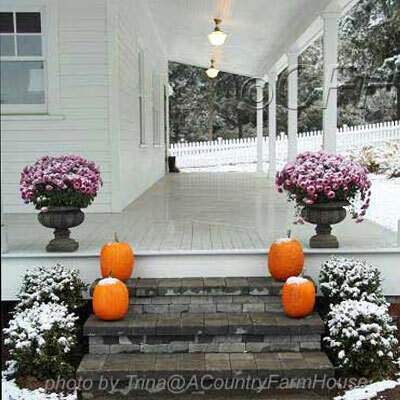 Mary and I grew up on country porches; they remain our favorites today! 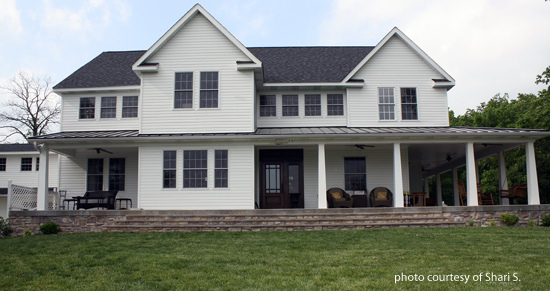 Typical country wrap around porch - open style - beautiful home! 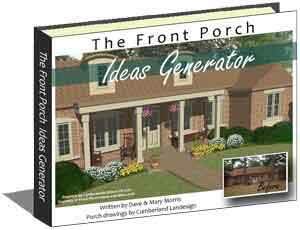 Wrap around porches gives you lot of opportunities other porch designs do not. For one you have a larger porch. And in most cases, you can always get some nice shade or a breeze from one of the sides. And you can create more than one sitting area. Or perhaps a sitting area plus a dining area. How nice to be able to have these options. Here is another view of this lovely home. Almost looks like they have two front doors. 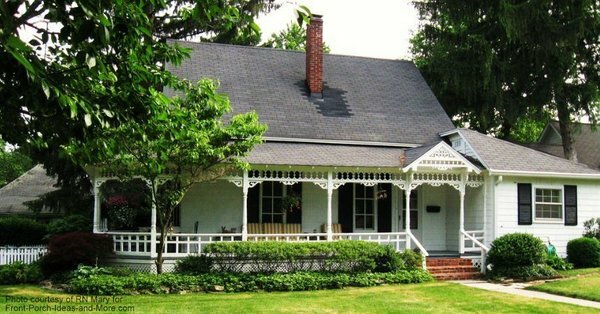 What an intriguing wraparound porch and country style home. 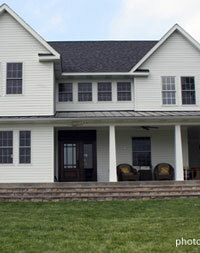 One of our kind site visitors asked for help in decorating and furnishing her large wrap around porch (pictured below). Mary and I thought we'd share our ideas we offered her with all of you. 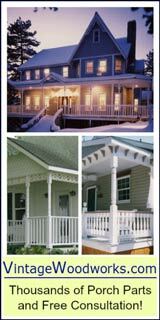 When building new country style porches, consider incorporating some of these ideas into your design. 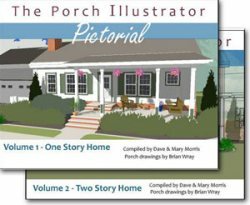 If working with an existing country style porches, Mary and I hope you can use some of these ideas on your porch as well. 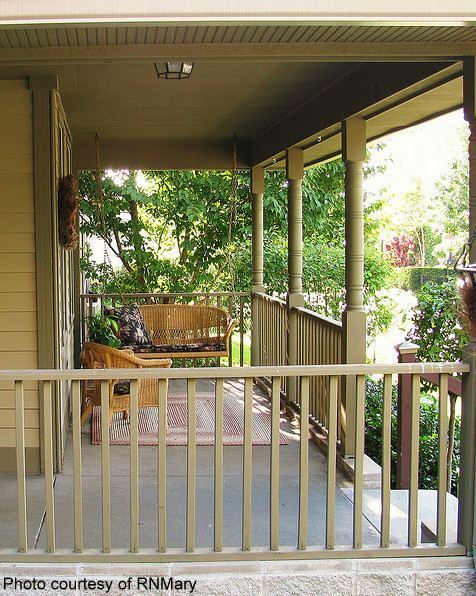 Think of your porch space as outdoor rooms waiting to be defined, furnished, and decorated! 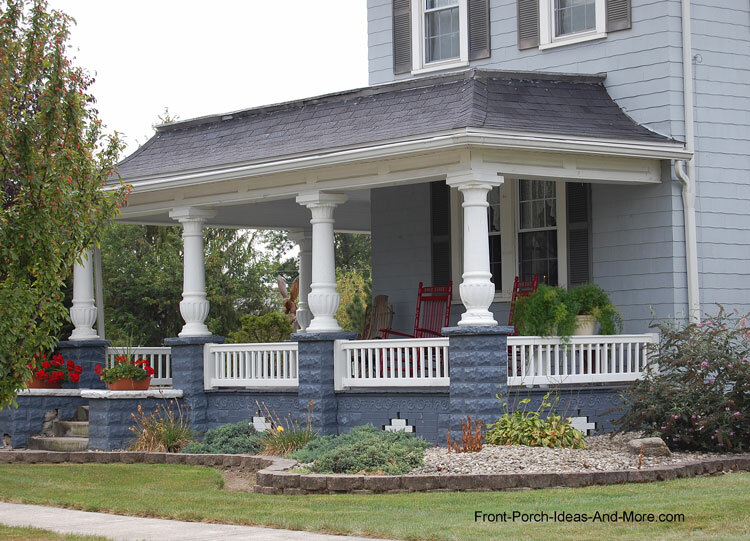 Enjoy these front porch ideas. Using the picture above and starting left to right, you have the perfect space for a privacy nook. This would be a space where you decorate for maximum comfort and would be used as a place to read a good book (or write one), meditate and relax. Depending on your personal desires you could hang a basket chair or small swing, chair or two with colorful comfortable cushions, a small table and outdoor lamp for reading, a nice outdoor rug, and perhaps a water feature for just the right background noise. You might also want to consider mosquito curtains or outdoor curtains in this area. Another option for this space might be along the same lines with a little different purpose. Try it with a bistro table and chairs for two or four, outdoor chandelier or hanging light over the table, soft mood lighting, and transform it into an intimate spot for wine and cheese! You want to lead visitors to the front door. You can create an "entrance" by placing your furniture to channel people. For example, if you place the two chairs with their backs to the door and have them face to the right (instead of the front) you'll accomplish two things. 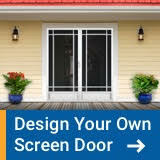 One, it will visually (and physically) lead visitors to the front doors and two, it will create the beginnings of a conversation/living room area on your porch. You can do this with the chairs or use an outdoor sofa. 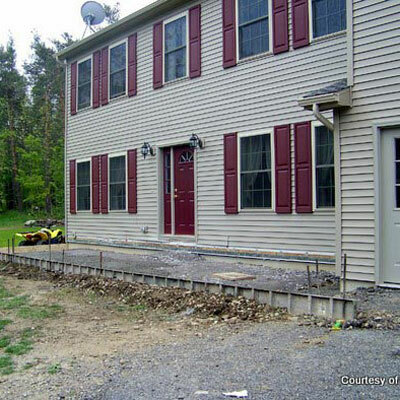 Experiment with the placement to get the right width for your entrance; you don't want it too narrow since you have sufficient space. Now that you have a defined entrance, I'd create a focal point for the "entrance". You can use outdoor artwork, planters and wreaths to decorate the entrance as you would a foyer in your home. The next area will be the corner. It extends from the entrance way you created and extends around the corner. Reason being, is to compensate for the weather. Think of this area as a living room with comfortable seating for conversation and large gatherings - southern porch style. 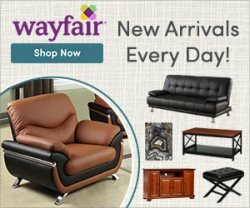 Sofas, chairs, tables, porch swings, hanging chairs, outdoor rugs, special outdoor lights and wall art can be effectively used in this area. You can make this as formal or informal as you'd like depending on your own needs. Color coordinate to blend the area together as it will be large. You don't have to have lots of furniture; you can spread it out a bit if need be. Planter boxes on the edges could also help to define the area. The remaining area around the other side of the porch in the above photos is for "fun". This is the eating/party/game area. I don't have a picture of that part of the porch so I"m speculating on what it might look like. It almost becomes the outdoor kitchen/cook out area with large picnic style table, serving and storage area. If it shares a kitchen or dining room wall consider a pass-through for food and snacks. You can separate it from the living area with furniture placement, and partitions. Finish it with an exterior refrigerator. Because of the versatility and variety of outdoor products, use your imagination and create a festive family spot. Outfit it with comfortable outdoor furniture, storage containers, and even a fireplace for those cool fall evenings. Like sports? Make it your own tailgate space with outdoor grills, coolers, and wet bar if you so desire. Want to watch the big game? Hang an exterior flat screen TV; the whole family will love it! With just a chair and a swing you can immense hours of shared time with loved ones on your porch. It does not take much to have fun! Use these photos from which to generate design, decorating, and furnishing ideas. As you study the photos for ideas please note our comments. We point out specific items you may not have previously considered. Show off your country porch - send us your pictures! 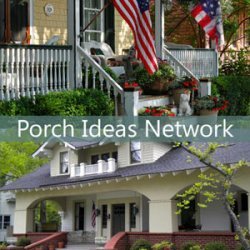 We'd love to see pictures of your country porch and may place them here for other's to see as well. It's so easy. Snap photos and send them to us. Large porches do not necessarily require lots of furniture to make them feel warm and welcoming. In the photo above note the combination of traditional rocking chairs and straight-backed chairs, how they are arranged, along with small tables adorned with plants. Adding a decorative piece like the old rocking horse not only adds interest but also serves as a conversation piece as well. Note the lantern lights on each side of the front door. Careful selection of lighting fixtures can also add unique charm as well. 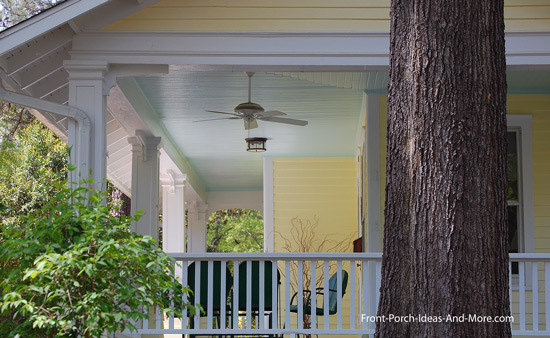 Country style porches are not afraid of color. Go ahead and insert bold colors as in the photo above. The colorful chairs definitely call attention to the porch and add a little whimsy tool. 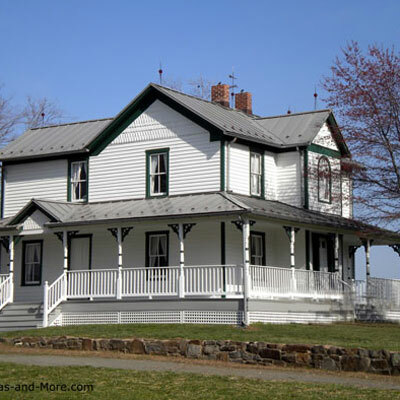 Mary and I also love standing seam metal roofs over the porch like the ones in the photos above and below. We like metal roof so much we created an entire section about them that you just have to see to believe! 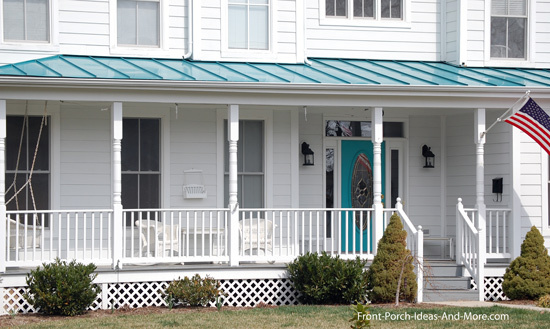 Metal porch roofs last a long time and come in a wide variety of colors. 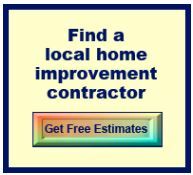 See our photos and ideas for metal roofs and find which style best fits your country home plans. You don't need a lot of color to make a visual impact. 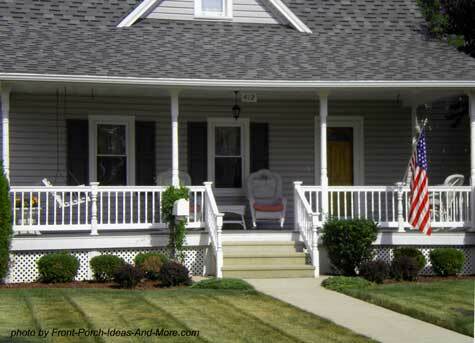 The front door in the photo above is all you need on this white front porch. You could add outdoor cushions in the same color as the door for an even more dramatic affect. 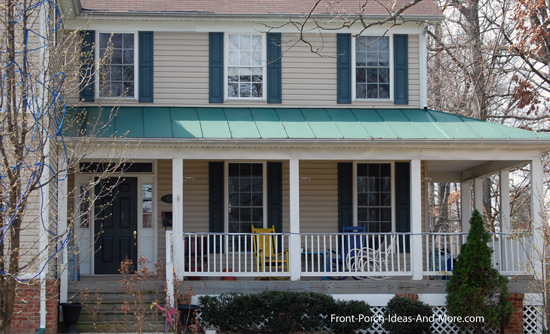 Large porches give you the option of dining out. A simple bistro table and chairs allows for relaxing over wine and cheese. 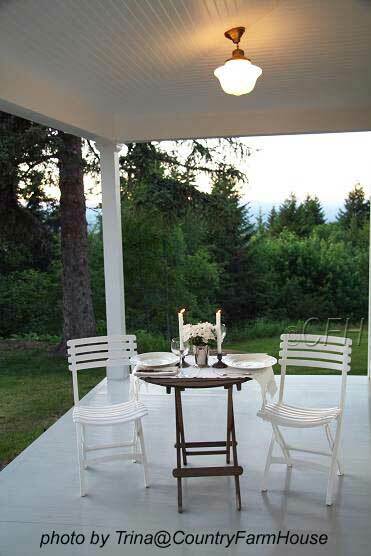 Add an outdoor chandelier and place on an outdoor rug - create the romance! 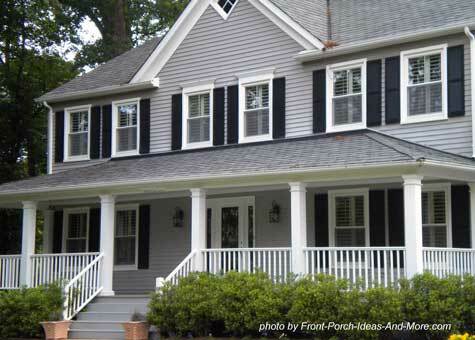 Almost every porch can benefit from an outdoor fan. 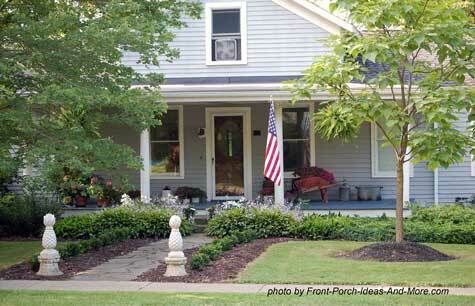 Porches are meant to sit on and relax and what better way to do it than catching a nice breeze. One of my favorite porches. 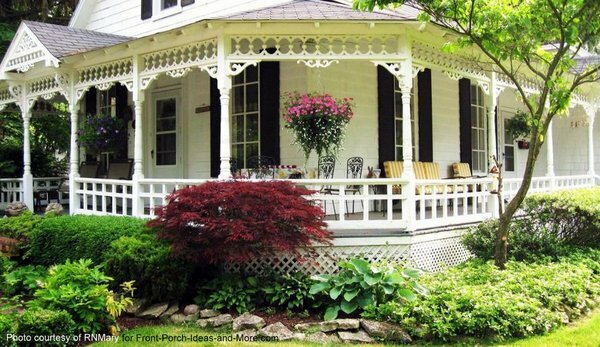 I love open country style porches and landscaped walkways leading to them. This one just says "come sit". Dave and I have always thought that gray homes are attractive. 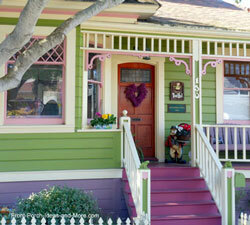 This one surely is charming - and what a porch. Just plain nice. Reminds me of my Grandma's porch. 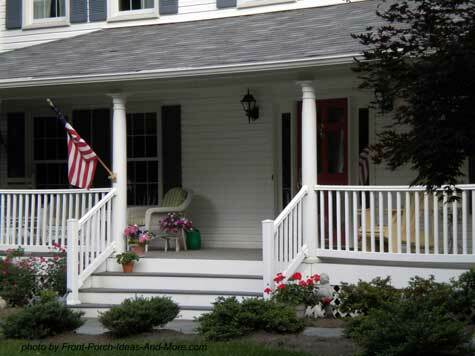 Wicker chairs, porch swing and American flag on a great porch.